The Who could soon reunite to release a new album. 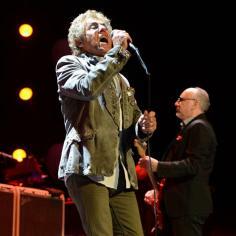 Frontman Roger Daltrey claims guitarist Pete Townshend has ''about 90 songs'' for a new record and he wants to stick to the band's iconic sound. Roger said: ''We're not going on the road next year - but we might do an album. The process involves identifying the songs that I can find in me [to sing] emotionally. The musicians could be set to reunite with drummer Keith Moon and bassist John Entwistle to record the follow-up 2006's 'Endless Wire' before heading out on tour next year. The 69-year-old singer says their arena tour in 2013, during which they played their 1973 double album 'Quadrophenia' in its entirety, took its toll on the band. He added to MOJO magazine: ''We're definitely touring in 2015, that will be the last ever one.